Long ago, when I was young and daft, I bought into the idea that southern England is inherently less friendly than the north. I suppose when you’re young and daft, and you don’t know who you are yet, you sometimes reach for stereotypes to shore up your fragile sense of self. These days I know a lot better, having spent plenty of time down south and met some lovely people – many of them, incidentally, down the pub. The week after Christmas proved a great example, as Get to the pub.com went visiting the in-laws and had a grand old time in the warm and welcoming hostelries of Hertfordshire. True, southern England effectively kept Thatcher in power when the rest of Britain desperately wanted shot of her, and thus shredded the social fabric of the entire nation. But after a few beers and a round of Auld Lang Syne down the pub it seems quite possible to let even these bygones be bygones. The pub, it’s worth remembering, is one of the few places where that fabric can still hold. Also this week, Get to the pub.com would like to say a big thankyou to Barm at I Might Have a Glass of Beer for the praise lavished on this blog by his Golden Pint awards. For those of you who are not Barm, of course, this is also a handy way of getting you to read the lovely things he’s said about us. For those of you who are Barm, thanks ever so much! So what do you like to do when you’re at a loose end in Hatfield? Here’s an odd place: an unromantic post-war New Town built around a small and really attractive medieval centre. It’s in the latter part, Old Hatfield, that me and my girlfriend find ourselves with a Thursday evening to pass. We’re not disappointed to pass it in the Horse & Groom (pictured above), where the charm of the haphazard cottagey streets outside steeps the very ceiling beams. Smooth and gluggable, the Fullers ESB is in good nick, and with the freezing weather we’ve had lately, the log fire works wonders too. One very distinctive thing about the pubs of Hertfordshire seems to be the extraordinarily high incidence of dogs. What is it about this place, that no pub seems able or willing to do business without a spaniel panting at your feet? The visitor can only conclude that local licensing regulations stipulate how intoxicating liquor may be served only in the presence of man’s best friend. 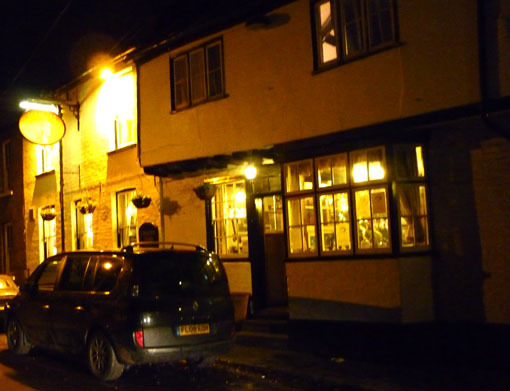 The Horse & Groom is no exception; nor is the Crooked Billet in Colney Heath, where we spend new year’s eve. Just in case the unthinkable happens, and nobody brings a dog, the pub has one of its own on standby, so as to maintain a canine presence at all times. Not that Oscar is the centre of attention tonight. We’ve chosen to see in 2011 at the Crooked Billet because they’re not charging to get in, because it’s not likely to get horribly jammed, and because I’ve been here once before and remember it as a very nice pub. It’s wonderfully friendly here tonight and the three of us have a lovely evening (my girlfriend’s sister is here this time). There’s also some nice free food and a 1960s/70s disco sort of thing, which means we tak enough cups of kindness to get all tipsy and embrace strangers as Big Ben chimes twelve over the telly. Auld acquaintance may be forgot, but dancing to ‘Hi Ho Silver Lining’, unfortunately, is remembered quite clearly. On new year’s day in St Albans the Beehive keeps up its impressive record of having been refurbished or redecorated every single time I walk through the door. Surely no pub has ever undergone such frequent aesthetic change as the Beehive. I swear they even replace the curtains while I go to the toilet. Sofas in pubs are, of course, an abomination – anti-social, impractical and every kind of wrong. Sitting on one tonight would directly contravene one of my key Rules of Pub. So instead we sit at a table which is also every kind of wrong. It’s a round table which is far too big for the space it’s in and almost forces the three of us to shout across it to be heard. I like the Beehive, but not as much as I used to. All these refurbs are making the pub worse, not better. So we head off somewhere else pretty quickly, and this time we opt for the Goat (above). Some readers might recall Get to the pub.com featuring the Barge in Grimsby, the first pub I loved, when I was 18, the pub that defined me. The Goat fulfilled the same role in the lives of C and her sister when they were 18. They brought me here in the early 1990s, when I first knew them. It was alive with thoughtful young indie people, disaffected, big-coated and bedraggled. Tonight it’s awfully quiet. We sit at the back, which used to be the Goat’s beating heart. It needs heart surgery. There are a few people at the front of the pub, but we don’t realise this until we leave. I cherish a super, creamy pint of Tribute. But after the fun of the Crooked Billet the previous night, it’s a downbeat way to end a good week in pubs. 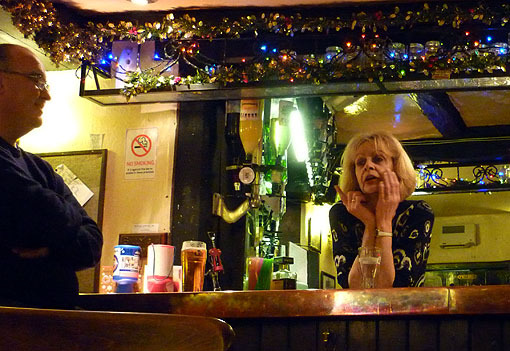 The friendly woman behind the bar takes the opportunity to clean some tables early on, while they’re empty. There can’t be many sadder sensations in a pub than the smell of furniture polish at half past nine.